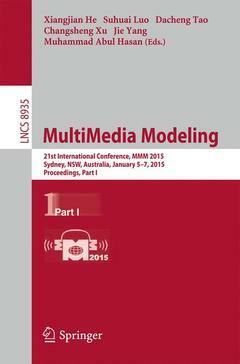 The two-volume set LNCS 8935 and 8936 constitutes the thoroughly refereed proceedings of the 21st International Conference on Multimedia Modeling, MMM 2015, held in Sydney, Australia, in January 2015. The 49 revised regular papers, 24 poster presentations, were carefully reviewed and selected from 189 submissions. For the three special session, a total of 18 papers were accepted for MMM 2015. The three special sessions are Personal (Big) Data Modeling for Information Access and Retrieval, Social Geo-Media Analytics and Retrieval, and Image or video processing, semantic analysis and understanding. In addition, 9 demonstrations and 9 video showcase papers were accepted for MMM 2015. The accepted contributions included in these two volumes represent the state-of-the-art in multimedia modeling research and cover a diverse range of topics including: Image and Video Processing, Multimedia encoding and streaming, applications of multimedia modelling and 3D and augmented reality. Image and Video Processing.- An Efficient Hybrid Steganography Method Based on Edge Adaptive and Tree Based Parity Check.- Secure Client Side Watermarking with Limited Key Size.- Orderless and Blurred Visual Tracking via Spatio-Temporal Context.- Coupled Discriminant Multi-Manifold Analysis with Application to Low-Resolution Face Recognition.- Text Detection in Natural Images Using Localized Stroke Width Transform.- Moving Object Tracking with Structure Complexity Coefficients Real-Time People Counting across Spatially Adjacent Non-Overlapping Camera Views.- Binary Code Learning via Iterative Distance Adjustment.- What Image Classifiers really see - Visualizing Bag-of-Visual Words Models.- Coupled-view Based Ranking Optimization for Person Re-identification.- Wireless Video Surveillance System Based on Incremental Learning Face Detection.- An Automatic Rib Segmentation Method on X-ray Radiographs.- Content-based discovery of multiple structures from episodes of recurrent TV programs based on grammatical inference.- FOCUSING PATCH: Automatic Photorealistic Deblurring for Facial Images by Patch-based Color Transfer.- Efficient Compression of Hyperspectral Images using Optimal Compression Cube and Image Plane.- Automatic Chinese Personality Recognition Based on Prosodic Features.- Robust Attribute-Based Visual Recognition Using Discriminative Latent Representation.- An Analysis of Time Drift in Hand-Held Recording Devices.- A Real-Time People Counting Approach in Indoor Environment.- Multi-Instance Feature Learning Based on Sparse Representation for Facial Expression Recognition.- Object Detection in Low-Resolution Image Via Sparse Representation.- A Novel Fast Full Frame Video Stabilization via Three-layer Model.- Multimedia Mining and Retrieval.- Cross-Modal Self-Taught Learning for Image Retrieval.- Multimedia Social Event Detection in Microblog.- A Study on the Use of a Binary Local Descriptor and Color Extensions of Local Descriptors for Video Concept Detection.- Content-based Image Retrieval with Gaussian Mixture Models.- Improving Interactive Known-Item Search in Video with the Keyframe Navigation Tree.- Large-scale Image Mining with Flickr Groups.- FISIR: A Flexible Framework for Interactive Search in Image Retrieval Systems.- Auditory Scene Classification with Deep Belief Network.- An Improved Content-based Music Recommending Method with Weighted Tags.- A Unified Model for Socially Interconnected Multimedia-Enriched Objects.- Concept-Based Multimodal Learning for Topic Generation.- Audio Secret Management Scheme Using Shamir's Secret Sharing.- Live Version Identification with Audio Scene Detection.- Community Detection Based on Links and Node Features in Social Networks.- Multimedia encoding and streaming.- Scaling and Cropping of Wavelet-Based Compressed Images in Hidden Domain.- MAP: Microblogging Assisted Profiling of TV Shows.- Improved Rate-Distortion Optimization Algorithms for HEVC Lossless Coding.- A Novel Error Concealment Algorithm for H.264/AVC.- Edge Direction-based Fast Coding Unit Partition for HEVC Screen Content Coding.- Signal-aware Parametric Quality Model for Audio and Speech over IP networks.- 3D and Augmented Reality.- Patch-Based Disparity Remapping for Stereoscopic Images.- 3D Depth Perception from Single Monocular Images.- Muscular Movement Model based Automatic 3D Facial Expression Recognition.- Azimuthal perceptual resolution model based adaptive 3D spatial parameter coding.- Flat3D: Browsing Stereo Images on A Conventional Screen.- Online 3D Shape Segmentation by Blended Learning.